Insert coins in it you will. And out comes sweet f**k all. Coke. Or no Coke. There is no Pepsi. These are not the drinks you’re looking for. Vending machine is at there. Wait, you forgot to pan back so we could see the rest of the universe in the picture. What the Oracle said was true! 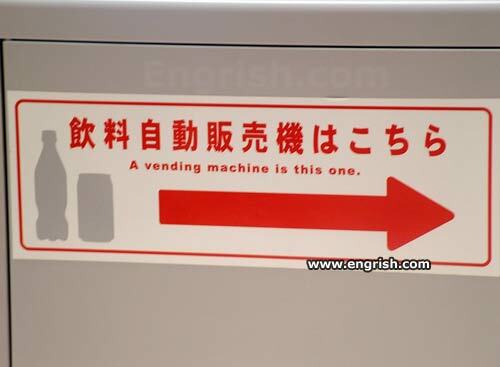 Ceci n’est pas une vending machine. Episode IV: A New Coke. The definitive: THE VENDING MACHINE. I AM THY VENDING MACHINE, AND THOU SHALT HAVE NO OTHER VENDING MACHINE THAN ME! You found the vending machine! A winner is you! This is not the vending machine you are looking for. Looks like a Coke bottle…it must be this real thing. mistakenly thinking can and could next to each other looked wrong. @Droll not Troll: Forgot the question mark. …so thought you’d be ok with it? I, a soda shall drink. The vending machine is disguised as a 6’8″, 350-pound, construction worker.